When Apple recently announced its latest financial results, there was little to get too excited about. Big sales are a given these days for Apple, but with new products not expected for another month or two, the analysts that like to make so much noise just haven’t had too much to feed on, making this particular call even more boring than usual. That’s not always a bad thing though, because if Apple had dropped any bombshells this time around, Slate’s Jordan Weissmann wouldn’t have been able to take the time to put together one of the more interesting graphs we’ve read this week. 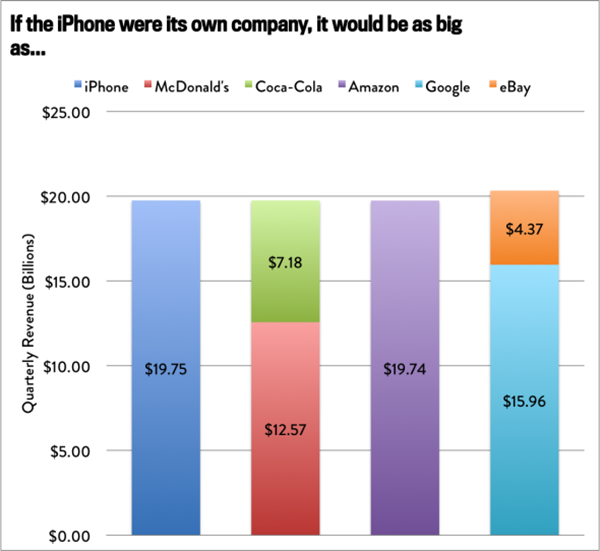 It’s been said before that if you carved Apple into smaller companies based on their individual product lines, those companies would do pretty well on their own. In fact, as Weissmann points out, the iPhone alone generates more revenue for Apple than Amazon can manage to put together. In fact, bunch Google and eBay together, and the results aren’t quite what you might expect. Buoyed by the results, Weissman didn’t stop there. Coca Cola, Facebook, Yahoo! 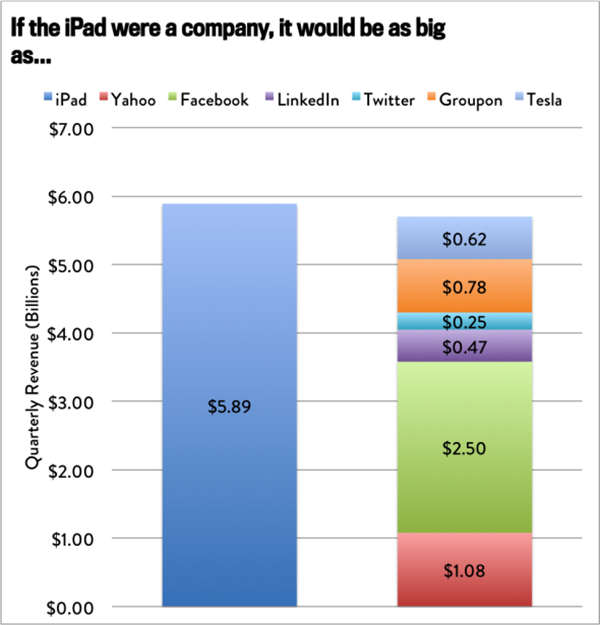 and more were all compared to product lines like the iPhone and iPad with the resulting graph leaving everyone in no uncertain terms that, no matter what doom and gloom the so-called analysts manage to conjure up, Apple is still doing very nicely indeed. In fact, we’re willing to bet that any other company on the face of the Earth would love to have an iPhone or iPad in its ranks. After all, you just have to look at the number of companies that are desperately trying to play catch-up by whatever means necessary. Yes, we’re looking at you, Samsung. Oh, and before we leave you, just think about this: Apple’s hardware accessories business of earphones, Lightning cables etc., generated $1.3 billion during the last results period, larger than fast food company Chipotle’s $1.05 billion. What do you make of all this? 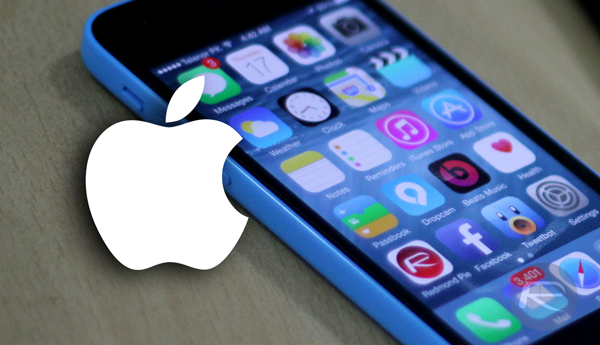 Do you believe that Apple is well and clearly doomed as analysts claim it to be? Or does it have good mileage on its mission statement?